FoSG are an enthusiastic group who wish to encourage everyone, with an interest in Sydney Gardens, to become a member. The FoSG newsletter will keep you informed of what is happening to your park. If you would like to become a member of FoSG or have any suggestions on improving or maintaining your park, please contact the FoSG secretary Gill, email: info@friendsofsydneygardens.org. FoSG shared a stand with B&NES at the recent Bath Carnival event held in Sydney Gardens. The event was a great success and enabled us to discuss the programme of improvement to the Gardens with the people attending the Carnival event. Several people signed up as new members. 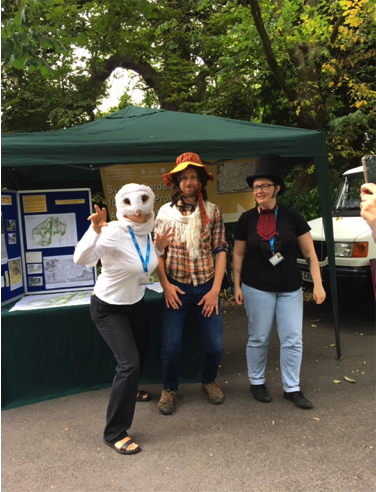 The photo shows B&NES project team for the HLF in fun fancy dress. 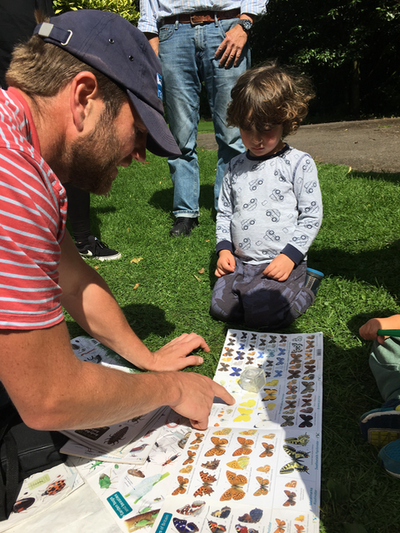 Bug and mini beast’s activity, organised by the RSPB drew great interest. The children used nets to catch various bugs which were then identified by the RSPB team. The activity was enjoyed by many inquisitive children. The long awaited repairs to the benches in Sydney Gardens took place in August. The improvement has greatly enhanced the appearance of the gardens. The benches now looked cared for rather than neglected. This may be only a temporary solution while the HLF plans are established. However the appearance of the benches and the ability to use the seats is greatly appreciated by the many Sydney Gardens users. Sydney Gardens recently hosted the first day of the Bathscape Walking Festival. 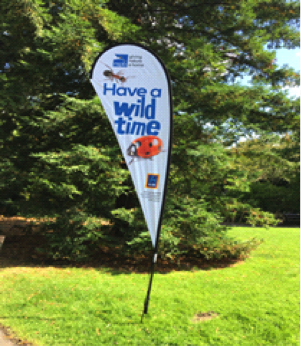 This event was organised by Sue Palmer, the Sydney Gardens Community Ranger. Sue is part of the project team helping to develop the plans for the Stage 2 bid to the HLF. Sue is organising activities over the coming months for all ages, as part of this development phase. On the day of the walking festival there were Mindfulness Walks and historic tours of the garden - all very popular and fully booked! Sydney Gardens is currently in the ‘Development Phase’ of a Stage 2 bid to the Heritage Lottery Fund (HLF) to secure a £3.6 million grant to improve the historic park. The funding will be used to restore historic buildings, invest in landscaping works, renovate the play area for use by people of all ages and create new gardens, alongside a programme of events and activities. The project will celebrate the fascinating history of the gardens, with its Galas, Illuminations, Cosmorama, Labyrinth, Merlins Swing, Concerts and Public Breakfasts. 8th Oct 2017 - Gardening Sessions begin in Sydney Gardens EVERY 2nd SUNDAY OF THE MONTH, at 10am-12pm; meet at Gardeners Lodge. We have the tools and gloves, just come along and join in with the volunteers. 14th & 15th Oct 2017 - ‘House of imagination, pop up’ at Gardeners Lodge and in SG 10am to 5pm each day. Art activities for children and their families led by visual artists exploring the world of the imagination! Free, drop in. 19th Nov 2017 - FoSG AGM will take place Sunday afternoon 3pm – 4pm in the Bowles Club on Pulteney Road. Come and join us for tea/coffee & cake. Give views on the HLF in SG and find out what progress has been made. 25th Nov 2017 - 11.30am - 4.30pm Public consultation about SG HLF project in Gardeners Lodge. Come and see the latest plans. Give feedback and share your ideas with the project team. 21st April 2018 - Bath Naturalists ‘Nature Watch’ – more information in the next newsletter. 22nd April 2018 - Sydney Gardens ‘Community Day’ coincides with World Heritage Day, with events taking place around Bath – more information in the next newsletter. ​Regular updates about events and about the project are put on the noticeboards at the entrances to SG. Unfortunately due to cuts in park funding there is no longer a full time gardener in the park.